Your Voice Matters.... Because You Matter! Koulla Yiasouma took up appointment as Commissioner in March 2015. She took time to listen to the views of a range of stakeholders and this led to the identification of priority areas of work which have the potential to make a real difference to the lives of Children and Young People over the next four years and beyond. 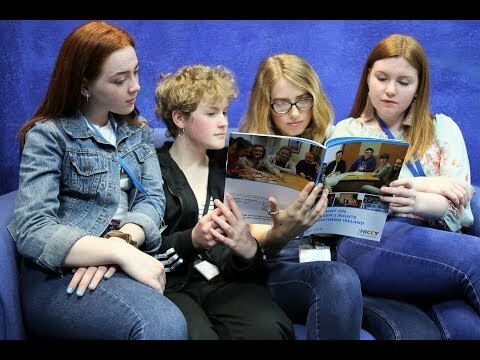 Children and young people’s Mental Health. At the end of June 2015, the Commissioner launched her ‘Your Voice Matters… Because You Matter’ project. This was a Northern Ireland wide engagement programme – a ‘conversation’ - to hear directly from young people themselves. The engagement programme will be ongoing between NICCY and children and young people and this section will be updated as the programme moves forward. The engagement programme will be ongoing between NICCY and children and young people and this section will be updated as the programme moves forward. If you have any queries, please contact the Participation Team (028 90311616 or participation@niccy.org).